In any large plastics facility, the materials being processed may be highly diverse, yet all are specifically engineered, selected, and blended for use in machines, molds, and processes whose parameters are carefully developed and must be precisely controlled. Once these elements are operating properly, all that’s required for ongoing production is a steady supply of the right resin, usually provided through a resin-distribution system. 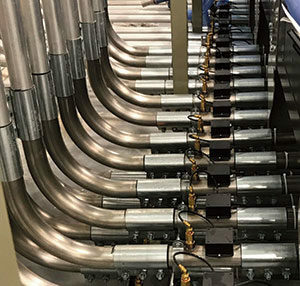 Yet, it can be easy for an operator, working with multiple resin “source” hoses and dozens of identical manifold “destination” slots, to connect the wrong hose to a given destination. The only question then is, how much is this error going to cost? Will it cost a hopper cleanout? Will it cost a material purge through the machine screw? Will it cost the need to sort out and destroy molded parts? Will it cost a downstream part safety concern or even prompt a recall of potentially contaminated or weakened parts? To download the full text of this article, please enter the information requested below. You will be redirected to a download link.